Electric skateboards are becoming more and more popular for all kinds of reasons. They’re an excellent source of entertainment, because who doesn’t want to ride around on a skateboard propelled by a powerful motor at speeds up to 30 miles per hour? Everyone who’s ever ridden on of these electric boards loves them! They’re also great for transportation, which is actually their original intension. Most of us drive around in cars every day, without thinking much about the pollution that it’s causing and the damage that it’s doing to the environment. However, if you ask most people, they all will say that if there were a reasonable alternative, they’d take it. Well, for a lot of us, riding a bike or walking to work or school just isn’t really efficient. Arriving at your destination dripping in sweat and then having to work for 8 hours isn’t really a great thought! You might also be interested in: The Riptide electronic board. Electric skateboards are an amazing solution to this problem. Not only do they reduce gas emissions (they use 100% electricity from their self-contained battery), but they also get you to your destination without any exercise necessary. Another great thing about these boards is that they almost all last a very long time on one battery charge. Instead of making you search all over the place for the perfect electric skateboard, we’ve done all the research for you. One of the best on the market is the Maxfind Electric Skateboard. This board has been known to last longer than most while achieving top speeds that overshadow much of the competition. Looking for something smaller? Try the Spectra electric board here. The wireless remote on the Maxfind Electric Skateboard is simple in design but incredibly effective in use. Not only does it fit perfectly in the palm of your hand, but all of the buttons are laid out perfectly to use while moving at high speeds. It can be difficult to switch buttons and speeds when you’re moving at a quick pace, but luckily this Bluetooth remote has it positioned for easy learning. With this remote, you get many different functions right from your hand. It allows you to speed up, slow down, choose your direction from a joystick, go backward, or start at whatever pace you set. It might seem like a lot, but once you get ahold of one of these wireless remotes, you’ll have no problem getting accustomed to it. As far as the charge time goes, these remotes charge up in just half an hour! For only 30 minutes of your time, you’ll get tons of fun or a great, easy way to get to work. Half an hour is much shorter than many other brands’ remote charging times. They usually take around 1.5 hours, which is obviously far too much! Another very important feature to any electric skateboard is the battery and the motor. The battery determines how long the charge will last, and the motor determines how fast the skateboard will go, and what degree it can go uphill. Obviously, having a powerful motor and a long-lasting battery is key to enjoying your electric board to the maximum potential. The lithium-ion battery on the Maxfind Electric Skateboard lasts for up to 16.2 miles per charge. This isn’t too bad at all, considering most others last only 7 to 10 miles. It only takes two hours to charge up, which is also pretty fantastic in comparison! Many other electric boards take 5 to 8 hours to charge up all the way. The powerful motor on this electric skateboard goes up to 23 miles per hour or 36 km/h. While many others go below 15, there are a few that max out around 30 miles per hour. While it might seem like 30 miles per hour is better, it’s not only harder to control, but it’s also illegal in some cities and counties. The double 1000 watt motor has no problem climbing steep hills while maintaining speeds of up to 20 miles per hour, which isn’t too bad either! Another great distance board is the ATOM board. Many buyers are concerned about the durability of these electric boards since they’re obviously not the cheapest things around. While many other brands cut corners and use cheaper woods or plastics, the Maxfind Electric Skateboard uses high-quality PP plastic and fiberglass. Fiberglass is well-known to be more weather resistant than almost any other non-commercial material, and it’s excellent for water-proofing. Speaking of that, the Maxfind board is waterproof with a rating of IP65, which is pretty impressive. This means that it’s entirely dust-proof and water-resistant from the spraying of sprinklers and such. However, it should be noted that you should never allow any electric board to submerge fully underwater. It’s nice to have a little protection though because there’s always that one house on the block that has their sprinklers on right when you’re riding by. Topped with strong grip tape and capped off with durable, high-quality wide wheels, the Maxfind electric board is a true beast among electric skateboards. It can withstand a lot more shock and water than most others, which is why durability is such a high point of importance for them. The competition might try to compare to the Maxfind board’s durability, but it’s hard to match durability, speed, and battery life all in one bundle! + The powerful motor and long-lasting battery are two of the many strong points for the Maxfind Electric Skateboard. It’s very challenging to find an electric board that has such a long-lasting battery paired with high-speeds, so when we found this one we knew it was a must-share! + The wireless Bluetooth remote that comes with this board fits perfectly in the palm of your hand while displaying all of the buttons and knobs you could need to easily navigate the roads without having to look down at it. + Made of high-quality PP plastic and fiberglass, this board is incredibly durable and weather-resistant. It’s also water-resistant up to IP65 and completely dust-proof. + Durable, thick tires are very necessary when cruising at speeds of 23 miles per hour. At that rate, normal skateboard tires would wear down in a matter of weeks or even days. Luckily, the Maxfind board uses special wheels made specifically for high speeds. – Many people prefer wood over any other building material for their electric skateboard. While fiberglass might seem weaker, it’s actually factory-proven to be much more weather-resistant and longer-lasting than most woods. – 23 miles per hour is definitely not the highest speed around, but it’s also not too far off. Not only that but in many areas, certain speeds are forbidden. This basically means that going any high than 25 miles per hour is pointless. The Maxfind Electric Skateboard is suitable for anyone looking for a reasonable and energy-efficient method of getting around town. This includes school, grocery stores, and work. It lasts for 16.2 miles, which is far more than almost any city in the world would need to get to your destination and back. Not only that, but at such high speeds you’ll have no problem getting there quickly. While cars obviously go much faster than 23 miles per hour, they have to stop very often and wait for people walking by, stop lights, stop signs, and more. If you’re riding an electric skateboard, you can navigate the streets much quicker than you could in a car in many cities and towns. If you’re looking for an alternative method to get around and have a super fun time while doing so, the Maxfind Electric Skateboard is worth a second look. We absolutely love the Maxfind Electric Skateboard for many reasons. With the best combination of speed and longevity, it’s hard to compare any other electric board to it. With such a reasonable price, we’re surprised most of the other brands can even sell a single board! When it comes to durability, Maxfind never shies away. It’s the ultimate electric skateboard for many enthusiasts – MPS included! It’s also nice to find an electric board that gives a true alternative to gas-emitting vehicles. Suggesting that a person rides to work on an electric board that lasts for 2 miles and rides at speeds of 8 miles per hour is kind of pointless, because there’s no way they’d get to work on time! However, the Maxfind offers a true, reasonable solution. If you’re looking for an even more durable electric skateboard, the M1 Electric Skateboard is worth a look. Poplar wood makes up the core of this board, which provides an incredibly strong center that can hold a lot more weight. The outsides of the board is made out of fiberglass, which as you know from the Maxfind board, is water-resistant and weather-proof. Looking for something lighter? Try the ACTON Blink lite board. There’s a reason why so many expensive pieces of commercial equipment like pumps, filters, and motors are all protected by fiberglass. 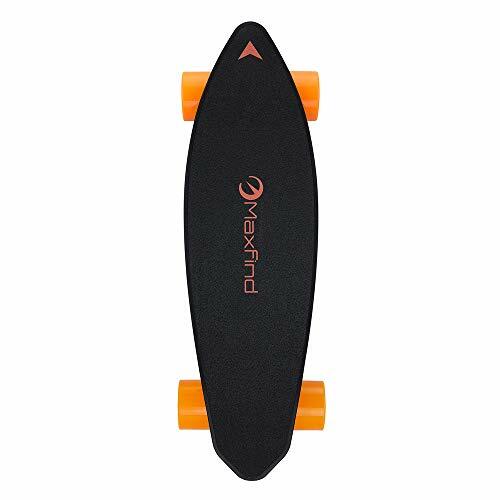 The M1 Electric Skateboard is an excellent alternative for an even higher durability, which brings a great peace of mind to any and all consumers!